If you are providing personally identifiable information and are not a resident of the United States, your country’s laws governing data collection and use may differ from those in the United States, in particular, the U.S. may not provide the same level of protections as those in your own country. By providing information to ISACA Chapter, you are transferring your personal data to the United States, and you consent to the transfer to, retention of and processing of your data in the United States. ISACA Chapter collects and maintains a variety of personally identifiable information, including [list information collected, such as: email addresses, phone numbers, credit card and other payment information, business and home addresses, as well as demographic information such as courses or areas of study in which you may be interested]. ISACA Austin Chapter collects information directly from you through, for example [list methods of collection, such as: online registration forms, as well as offline, through exam or event registration forms]. Information is collected and maintained from [list individuals from whom information is collected, such as: members, exam candidates, those who have been certified by ISACA, applicants, event attendees, speakers, participants in ISACA Austin Chapter programs, purchasers of ISACA Austin Chapter products and services, current and past web site users, survey respondents, and others]. To the extent that information requested is not required for your participation in a given ISACA Chapter program, you will be told which information is optional. Should you fail to provide optional information, certain ISACA Austin Chapter programs or features may not be available to you. ISACA Chapter may also maintain information about you that you do not directly provide, whether it is information received from third parties, such as business partners who provide exam administration services, or information ISACA Chapter collects about your activities. For example, ISACA Chapter keeps track of [list as appropriate: which events you have attended, which exams you have taken, which boards and committees you have served on, and which offices you have held]. ISACA Chapter uses personally identifiable information for the purposes described at the time of collection or as otherwise described to you; to process your requests; to report to others about whether you are certified or not; as permitted by law to provide you with information about ISACA Austin Chapter, our products and services or other products and services in which we believe you may be interested; or for other legitimate ISACA Austin Chapter business purposes, including order processing, processing of certification or membership applications, or registering you for event or training programs. We may also use your personally identifiable information to tailor your experience at our sites, to compile and display content and information that we think you might be interested in, and to provide you with content according to such preferences. [Include the following as accurate and appropriate: ISACA Austin Chapter also publishes the names, titles, country and business affiliations of officers, committee members and others who have assisted with initiatives or projects]. When we believe it is necessary to cooperate with law enforcement or in response to a government request, including if specifically requested or required, as otherwise permitted by law, and for other valid ISACA Austin Chapter business purposes. ISACA Austin Chapter also may use your profile information on an aggregate basis – without personal identifiers – to provide third parties with information, such as to help us develop new features and content for the Site, and to provide Sponsors and others with aggregate information about our users and the usage patterns of the Site. ISACA Austin Chapter retains personally identifiable information for as long as necessary for its legitimate business purposes, and as otherwise permitted by applicable law. 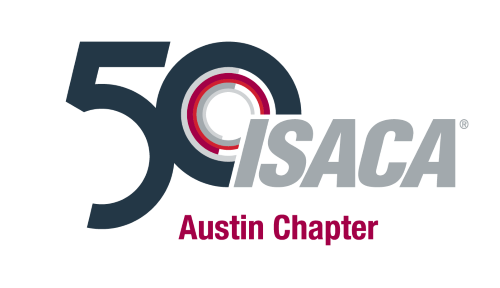 ISACA Austin Chapter uses reasonable measures to safeguard sensitive personally identifiable information, which measures are appropriate to the type of information maintained, and follows applicable laws regarding safeguarding any such information under our control. In addition, in some areas of our Site, ISACA Austin Chapter may use Secure Socket Layer (“SSL”) or Transport Layer Security (“TLS”) encryption technology to enhance data privacy and help prevent loss, misuse, or alteration of the information under ISACA Austin Chapter control. ISACA Chapter cannot guarantee, however, that your information will remain secure. The Internet by its nature is a public forum, and ISACA Austin Chapter encourages you to use caution when disclosing information online. Often, you are in the best situation to protect yourself online. You are responsible for protecting your username and password from third party access, and for selecting passwords that are secure. To exercise your rights, you may make one request each year by emailing us at isaca.atx@gmail.com or writing us at the address listed in the “How to Contact Us and Modify Your Information Preferences” section below. Indicate in your letter that you are making a “Shine the Light” inquiry. Responses to requests sent to this email address or the mailing address listed below will be provided within 30 days. To help us keep your personal information up to date, or to request access to the personal information ISACA Austin Chapter maintains about you, you may contact us at isaca.atx@gmail.com. ISACA Chapter does not believe its Site is appealing to children, nor are they directed to children under 13. ISACA Chapter does not knowingly collect personally identifiable data from persons under the age of 13, and strives to comply with the provisions of COPPA (The Children’s Online Privacy Protection Act). If you are a parent of a child under 13, and you believe that your child has provided us with information about him or herself, please contact us at isaca.atx@gmail.com.